Do you know who Molly Kannamaly is? A big no will be the answer to it. But you all will remember Chala Mary of the Asianet serial Sthreedhanam. Yes, Molly Kannamaly none other than our beloved comedy character Chala Mary. Before coming into the field of acting she was an artist. She started performing Chavittunadakam, a Latin Christian art form, at the age of ten itself. Molly's distinct style of presentation made her so popular and close to the audiences. She stays in a small house, in fact a hut near Puthenthodu fishing gap in Kannamaly. But still she gets lot of calls from journalists and audiences. This sincere artist still continues to do her stage program even after becoming popular in the film industry. Molly Kannamaly, has suffered a lot to take care of her children when after her husband deserted her. She has two sons and right now she is staying with her elder daughter in law and her two grand children in her old house, which was left to her by her mother. It was ravaged by the 2004 tsunami. As she had lot of debts, she had to pay off her debts with the money she gained. After reaching the industry, her house was rebuilt. Molly says it is her luck to be a part of the film industry and she is very much thankful to renowned director Sathyan Anthikad who has lifted her. Molly who was born on 6th August 1963 in Kochin has studied only till third standard as her mother couldn't find a means to continue her studies. The artist who loves acting recollects that the first movie she saw was Nasser's Vishukaineetam. Then she never realized that one day she too will be a part of teh great film industry. Within a short span of time, Molly Kannamaly became popular in the television industry. It was the renowned mega serial 'Sthreedhanam' telecasted in Asianet which gave her a chance to showcase her talents and acting skills. Molly came into the picture after the first half of the serial. She gave life to the character named Chala Mary. Chala Mary is portrayed as the mother of Mathy Suku or rather Sukumaran Nair. 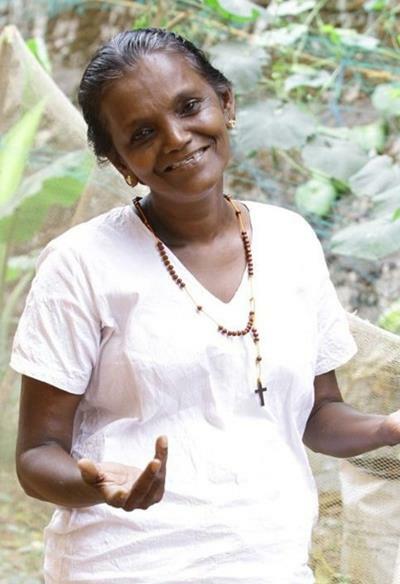 Mary was into selling fishes earlier and belonged to a poor family but later on her children became rich and thus she too is leading a leisure life now. The character Chala Mary became distinct through the glossy dress she wears and the kind of heavy gold ornaments she puts on. Another distinct feature of the character is the way Chala Mary speaks. That is perfectly gelled with the situation and the praise for it definitely, goes to Molly, the actress behind the perfection. By doing the character Chala Mary, Molly became widely accepted by one and all. Her high vocal power and full active participation might be gained from the Chavittunatakam. It is a costly play which takes lot of efforts and time. The Kerala Sangeetha Nataka Akademi honored her in 1999 for her contribution to Chavittunadakam. If we ever visit her house, we can see lot of trophies kept next to this one. It shows the actual talents of this great artist. Even after being popular in the industry, she still continues her stage programs along with it. The face, sound and the way of presentation of this wonderful actress is unforgettable to one who have seen her performance once. Molly Joseph, the stage artist started her career in the field of large screens through the movie "Kerala Cafe". Further she appeared in the 2010 film "Anwar", written and directed by Amal Neerad. In both these movies, she was given minor supporting roles. Later she also got a chance to be a part of the 2011 Malayalam flick "Chappa Kurushu", directed by Sameer Thahir. Molly Kanamaly was also seen in the 2013 Dulquer Salaman film "ABCD -American-Born Confused Desi". This film was directed by Martin Prakkat. Even though she got a character role here as well, her character stood out with a hit dialogue of hers. Luckily, by God's grace while doing the shooting, that dialogue was delivered by Molly without much thinking and the director did accept it so did the audience too. She also did act in the movie "Poppins". Molly's career changed when she got an opportunity to act in the Sathyan Anthikad film "Puthiya Theerangal". It was a good movie in which Molly got a very prominent role. She says that in the theater she was happy to see everyone clapping when she gives out dialogues. Seeing that she too laughed loudly and clapped along with them too. Another important feature of this incident is that it was the first visit of this actress to a theater. The people started identifying and recognizing her. That made her even more happier. She recollects the first day when she had a shoot. Molly was totally afraid when she saw the set and almost all the things in the modern world was unfamiliar to her. It is the industry that made this brave lady familiar with the outside world. She is very friendly and humors in nature and that makes her close to everyone. Molly says Fahad Fazil and Nivin Pauly are the two young artists that she likes the most. More offers will definitely come her way as she is talented and people want to see her on screen with her dashing performances and typical slang.